— All of the sport quads that you can buy these days are 4-strokes. However, older 2-stroke quads like Honda’s TRX250R are still a strong force for getting quickly around a track or down the trails. The lighter weight and snappy power make them easier to flick around and move quickly across gnarly terrain. The GNCC series is where the top cross-country racers show up to do battle and they spend a lot of time setting up their quads to be the best at getting to the finish line ahead of the rest. 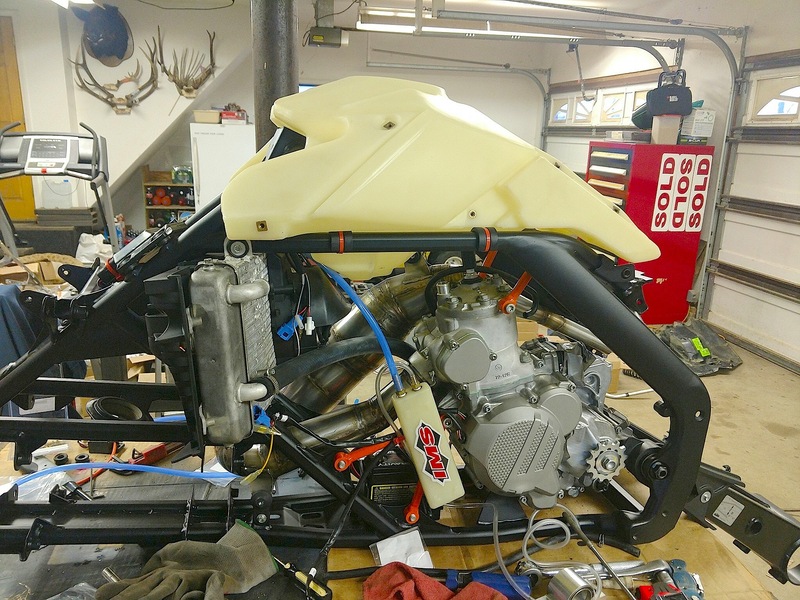 Walt Schumacher is a GNCC racer and here is the quad he’s building to ride this year. 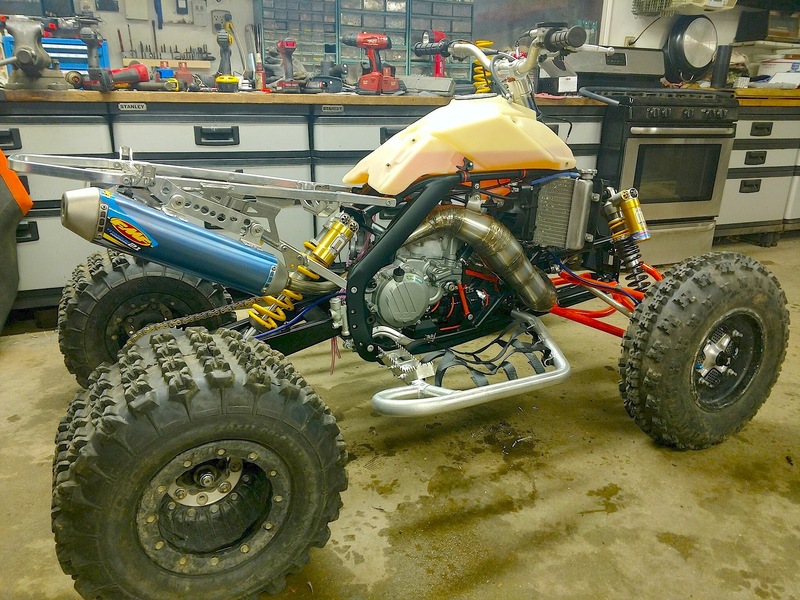 It began as a KTM 450 quad, but the engine was removed and in its place is a two-stroke engine from a KTM 300 dirt bike. This Austrian company is one that has continued the research and development of two-stroke technology. Their 300 engine represents the latest advancements of today’s two-stroke weaponry. It uses power-valves at the exhaust port, which you can see the mechanism covers on the engine where the header pipe mounts. What do these “power-valves” do? Well, they basically allow a two-stroke engine to make a broader range of power, even at lower RPMs. 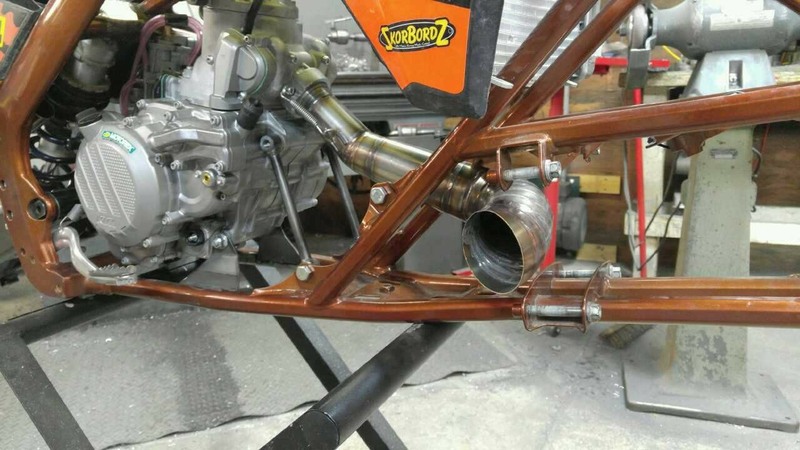 If you want a two-stroke to make the most power on top it has a tall exhaust port. If you want it to make more low-end torque it has a lower exhaust port. So, the power-valve raises and lowers the height of the exhaust port based on the RPMs at that split second. You can certainly tell the difference when riding a two-stroke with or without this feature. 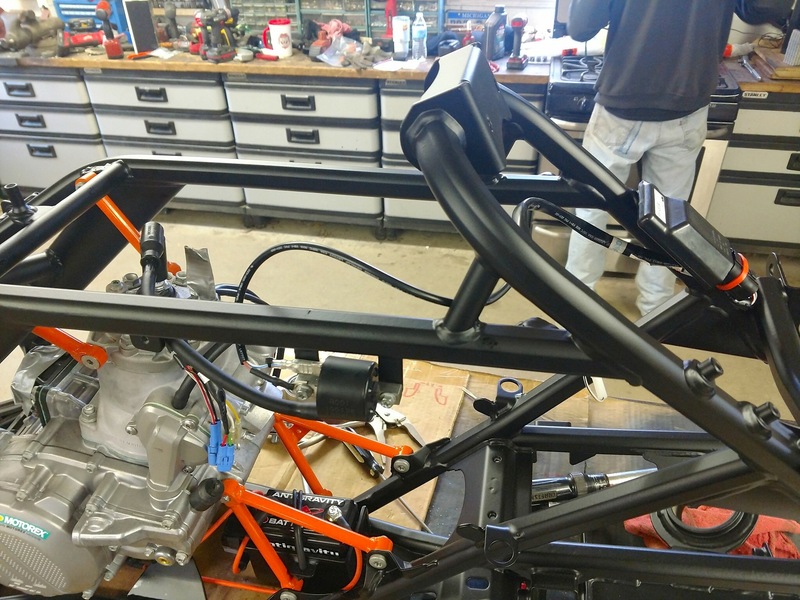 Another good thing the KTM 300 motor has is an additional balancing shaft. Just so you know, Honda’s 250R had an extra balancer shaft too. This was a normal feature of two-stroke quads that dirt bikes at the time didn’t necessarily have. It seems that the vibration of dirt bikes is limited to a narrower plane that is absorbed through their spokes. With quads, the vibration is spread out to the full width of the vehicle and is more easily noticed. Therefore, their engines have to be better balanced. It wouldn’t hurt if the two-stroke engines of dirt bikes were better balanced too, and KTM seemed to feel that way with their 300 engine. 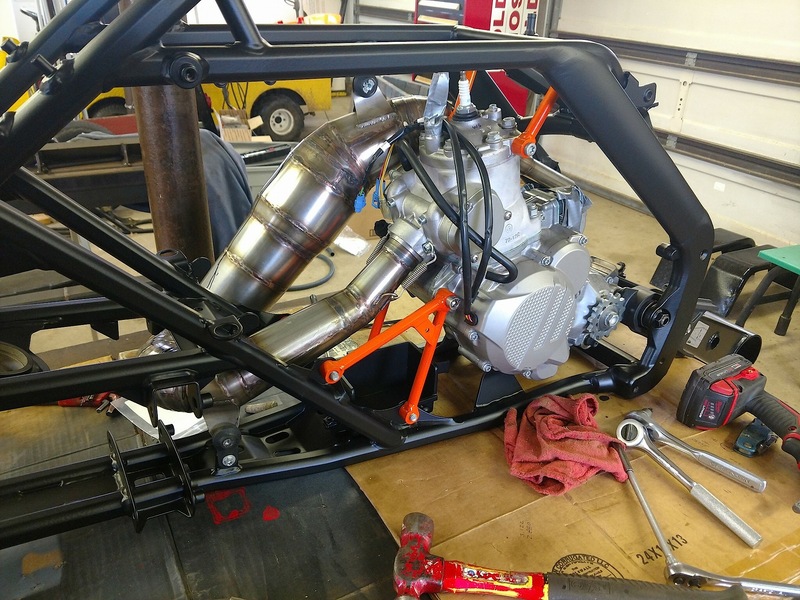 The first GNCC race for 2018 is in South Carolina on February 24 and Walt is planning on having his KTM 300 2-stroke quad ready in time for that. He is getting help and support for his project from various shops and aftermarket companies. It seems to be coming together well. We’re providing some photos here taken during the step-by-step process. 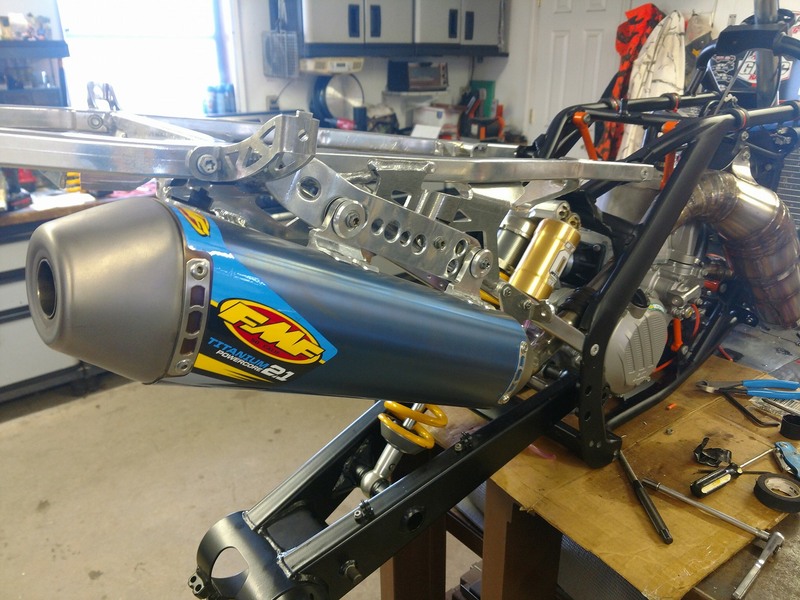 It gives you an idea of what all is involved when building a top caliber race machine and making sure everything fits and works just right. A pro race machine has to fit the rider like a glove and provide him with the confidence to take it to the edge. Keep in mind that he’s traveling at a higher rate of speed than most of us regular riders go. We’ll try to provide you with a follow up on Walt Schumacher’s KTM and give you a progress report on his results in the GNCC, so stay tuned. In the mean time, we’d like to do features like this on the machines of other ATV and UTV racers, from pro to the amateur levels. THE NEW MARCH 2018 ISSUE IS HERE!